A good extension will add value to your home as well as creating extra space. To make sure your scheme represents value for money, we offer a free assessment of your home looking at the existing layout and how best an extension will enhance your space. You may simply want an extension to your kitchen, or a completely new wing. You may want to subdivide your house into flats, or develop a self-catering annexe. We have experience in all these fields and can advise on the financial viability of your proposal. We begin the design process by using the latest software to produce three-dimensional models to show you exactly how your extension will look and how it will work. Our aim is to create a design that compliments the original house in every way. Whatever the period of your home, we aim to blend the old with the new in a design that will increase, rather than detract from, the value of your property. Careful design is essential in order to ensure you enhance the property rather than overdevelop it. With experience ranging from old farm houses to Georgian terraces, we can offer a confident and dependable service to find the right solution to your design problem. If you are considering a extension to your home please contact us for a free site visit and consultation on 0161 439 5569. Examples of some of our cheshire extensions can be found below along with recommendations from clients. 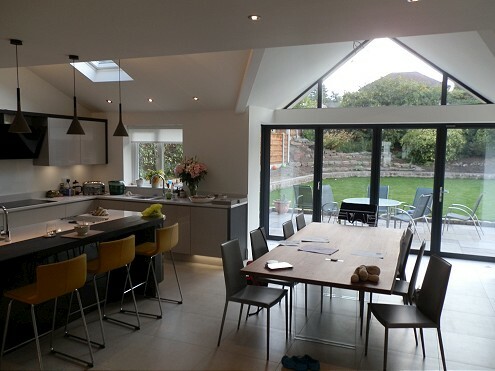 Simon carried out a total refurbishment of home - this included an extension to the rear to provide a new kitchen and enlarged dining room. I can confirm that the work was carried out to an extremely high standard and have no hesitation in recommending Exelby Developments. I am very glad that we chose Exelby Developments to carry out our kitchen extension. The team were excellent and worked very efficiently and cleanly, they completed the work in the estimated six weeks with skill and craftsmanship.